Discover Madrid with this 2.5-hour air conditioned bus tour visiting the most important avenues, squares and monuments of the city. Learn the history behind this capital on this city center tour that will take you from the old district of the Hapsburgs and Borbón Royal Families to the modern areas. Upgrade your experience and visit the Santiago Bernabeu stadium or enjoy a ride on the city's cable car. Book this 2.5-hour bus tour that will take you by the most important avenues, squares, buildings, and monuments of Madrid. 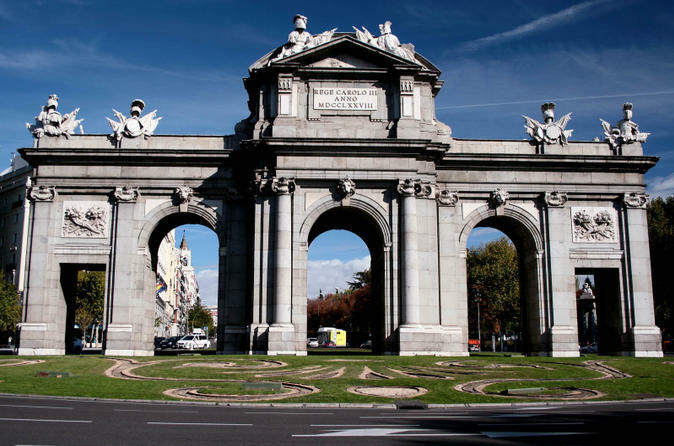 You will learn the story behind this amazing capital as you pass by its most important landmarks such as Puerta del Sol Square, Mayor street, Neptuno and Cibeles fountain, Las Ventas bullring where we will make a stop to take pictures (entrances to the monuments are not including), Puerta de Alcala, Paseo del Prado and Atocha. a visit to Santiago Bernabeu football stadium (home base of Real Madrid team) or a ride on the city's cable car with panoramic views.